While cooler than usual weather may delay the wildflower season in some parts of Texas, the good news is that many areas should have great blooms, and a few already show the first stirrings of spring. Fall and winter moisture are important as many popular wildflowers—including Texas bluebonnets, Indian blanket and Texas star—get a jumpstart on their spring growth by germinating during the winter and establishing themselves as rosettes. These clusters of leaves spread low across the ground to retain heat in the winter before the plants grow rapidly once temperatures climb. For Texans living in regions fortunate enough to have received timely precipitation, the wait is now on for the weather to warm enough to encourage wildflowers to begin blooming. But already along Highway 123 south of Seguin the Dugger Cemetery has a blanket of Drummond phlox, Texas groundsel and other wildflowers. And along Highway 37 north of Corpus Christi some large patches of emerging Texas bluebonnets have been sighted, as well as pink evening primrose. 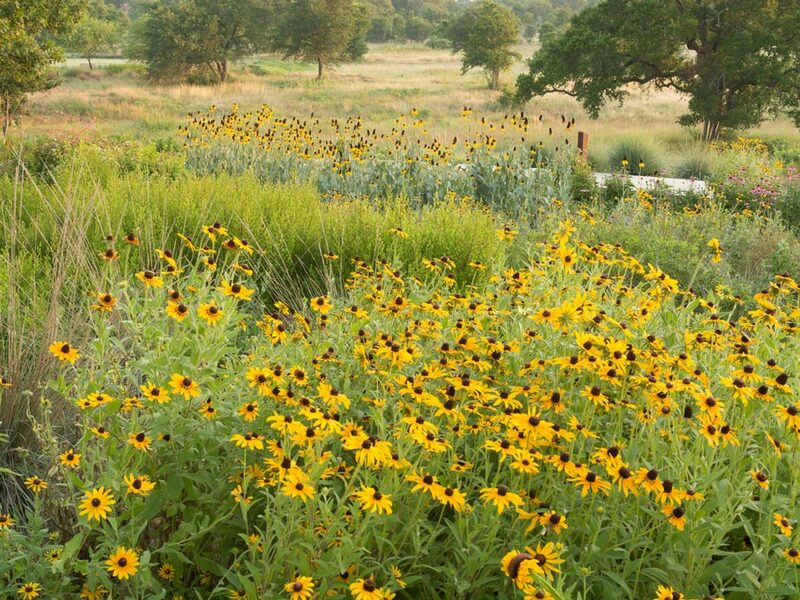 At Houston Audubon’s Edith L. Moore Nature Sanctuary, the leaves of a number of wildflowers including rosinweed, Texas coneflower, black-eyed Susan, rattlesnake master and blue-eyed grass are up, but not many have flowered yet. The exceptions are some violets and Carolina jessamine. Though temperatures are still cool in the Brenham area, good clusters of bluebonnets have begun to open up on the medians of Highway 290 and other locations. The Highland Lakes area also has a few early bluebonnets, as well as prairie paintbrush, Drummond and prairie phlox, and prairie verbena. Cold weather in North Texas has slowed the onset of this year’s season, but there have been sightings of spring beauties at the new Elmer W. Oliver Nature Park in Mansfield and elbow bush at Cedar Ridge Preserve in Dallas. And trout lilies, a harbinger of spring, came to life in recent weeks in Tandy Hills Natural Area in Fort Worth. Large colonies may be seen at places such as Dogwood Canyon Audubon Center, Cedar Mountain Preserve and White Rock Lake in Dallas. Along the River Road between Presidio and Lajitas and elsewhere in Presidio and southern Brewster counties, Big Bend bluebonnet and Torrey yucca are among the wildflowers spotted in early bloom. Meanwhile, the Texas Panhandle has been quite dry with very little snow, and early spring rain may be needed to help wildflowers flourish. At the Lady Bird Johnson Wildflower Center in Austin, Mexican plum, agarita, Carolina jessamine, golden groundsel and elbow bush are just a few of the plants currently in bloom. As the wildflower season progresses, the center will offer visitors abundant displays of many varieties—including bluebonnets. Wildflower sightings were provided by Flo Hannah of Houston Audubon; Minnette Marr at the Wildflower Center; Lu Hollander at the Brenham/Washington County Convention & Visitors Bureau; Michael Eason with Texas Flora in West Texas; Jim Varnum, Mary Grace Lopez and Melanie Huff, Texas Master Naturalists; and MJ Hansen and Jerry Morrisey of Texas chapters of the Native Plant Society.